“What is a small environmental problem to solve at school?” I will ask my elementary students at the start of the school year. “Climate change!” many eagerly respond, ready to save the world. Although I do steer them to smaller local issues, it made me realize how interested my students are in understanding the science they hear about on the news. We adults find it to be a complex issue, but these children are our future. It is their right to take part in the learning, in the discussions, in the discoveries. When I mention that for the past several years my fifth graders have designed their own experiments to study the signs of climate change, I receive puzzled looks. How can elementary students possibly understand it, much less create investigations to learn more about climate change? I explain that although the concept of rising atmospheric temperatures due to human contributions of heat trapping gases is a complex topic, students can simulate these signs of change using hydroponic plants. Why hydroponics? Perhaps it is time to offer a little background. I am an environmental science educator at a progressive public school where I can teach about climate change every day. Although required to teach all the New York State science standards, I infuse everything with an environmental focus. My students start working with hydroponic plants on their first day of school. 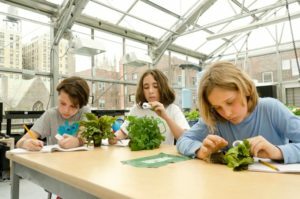 Kindergarten through fifth grade students attend my environmental science class in a 1400 square foot rooftop hydroponic greenhouse located on the Upper West Side of Manhattan. 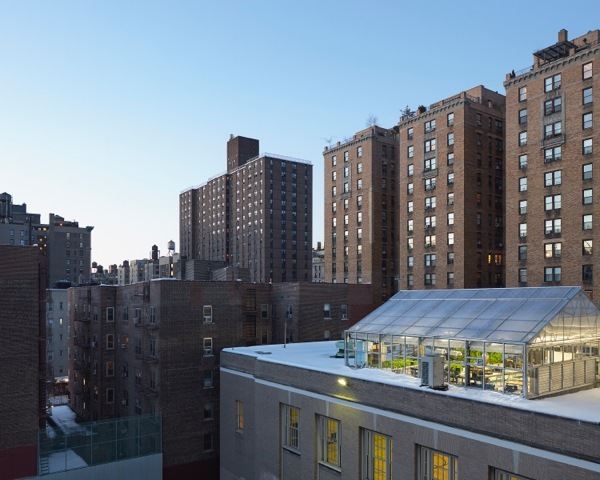 This greenhouse was built by New York Sun Works, a non-profit organization that builds innovative science labs in urban schools. Through their Greenhouse Project, hydroponic farming technology is used to educate students and teachers about the science of sustainability. My young farmers learn at an early age how to grow plants hydroponically in large systems that pump nutrient enhanced rainwater to plants. Classes learn how to maintain these systems, which also teach them about hydroponic planting media, pH, nutrients, water quality, and plant life cycles. However, students are not focused on plants their whole elementary careers. Sustainability and environmental stewardship steer the curriculum as students ponder energy, natural disasters, climate, human health, plant and animal adaptations, and other topics that teach students not only the required standards, but also what they will need to know to solve our current climate crisis. The labs that New York Sun Works build are meant to teach children to brainstorm solutions around issues of sustainability. Students are constantly on the lookout for problems to solve, whether the issue is located in the greenhouse, the school grounds, the community, or the world. By the time they reach fifth grade, students are clamoring to independently construct their own experiments. Since it is a requirement that students design their own scientific investigations, I guide them in setting up step by step projects that will have true meaning. We always begin with research. According to the U.S. Environmental Protection Agency (EPA), the effects of climate change can be observed in increases in air temperature, droughts, sea level rise, wilder weather, ocean acidity, melting glaciers, thawing permafrost, changing rain and snow patterns, and a decrease in sea ice and snowpack. Students with access to the Internet can easily click on one of these indicated signs of climate change to read more about the selected impact and see photographs that help to tell the story. The EPA kids’ page is easy to navigate and clearly worded, which encourages independent research, as do the kids’ pages on the NASA and American Museum of Natural History websites. Books, interviews with scientists, and field trips offer additional sources of information. Once students have researched the signs of climate change, they are ready to consider the implications for agriculture, water, and land use. Basically they have to ask the “so what?” of climate change. This is where an experiment with hydroponic plants comes in. We use plants as our test subjects because we have them at our disposal, and it is not illegal or unethical to create adverse situations for their survival. Using hydroponic seedlings is extremely practical, because the plants can be easily moved, and levels of nutrients, water, and pH can be efficiently adjusted and monitored. Some of the experiments can occur in a larger hydroponic system, but most of the experiments must happen in separate planters to ensure that all of the variables are the same except for the one that students want to test. Although we employ the use of plants as test subjects, our experiments are meant to relate to our everyday lives. For the most part, students are interested in extreme events caused by climate change. The experiments in this case are simple, as students construct simulations of the effects of wild weather, sea level rise, droughts, and hurricanes on agricultural crops such as lettuce, swiss chard, and other edible leafy greens. Levels of water and wind can be easily altered according to the students’ selected measurement patterns. After carefully maintaining the validity of the experiment and measuring the dependent variables such as height of stem, length of leaves or roots, or width of leaves, students conclude that adverse environmental factors make it difficult for crops to grow. Although the results of these experiments are not surprising, it is the implications for farming practices that make the students excited to consider future projects. Students do not stop at their results, but rather beg to begin a new experiment, or choose to communicate their findings to the school and community. Never ones to take the easy route, my students want to teach others about how climate change is affecting our food and water supplies, and what we need to do as humans to mitigate the effects. Last year the Secretary General of the United Nations met with 30 of my students after they wrote about their experiments to simulate climate change. Ban Ki Moon listened to their suggestions and offered his opinions as well. Some students are committed to studying the impact of climate change on animal habitats, and I try to help them design testable experiments with plants. For example, one student who read about disrupted migratory patterns wanted to learn the impact on fields of grass that are no longer disturbed by animal grazing. She and her partner over-planted grass seeds and in one section they picked out seedlings to simulate grazing, while in the other section they left the plants to fight for survival. They found that the healthiest grass plants were grown in the “grazed” section. Another student was intrigued by decreased access to food for arctic wildlife. We agreed that the only animal we could use as a test subject would be aphids, since we are always trying to rid our greenhouse of them. He and his partners selected two kale plants with similar numbers of aphids. Each week they took off one leaf from the test plant, while maintaining the number of aphids. At the end of their project they discovered the population of aphids increased on the plant that did not have its leaves removed, while the population of aphids slightly decreased on the test plant. They concluded that food shortage caused the changes in population growth. Although my students’ experiments are simple in design, the conclusions they make from these independent science investigations are always complex and far reaching. Students use their simulations to learn about implications for animal habitats, agriculture, and water usage, and their ideas are innovative and inspiring. Most partnerships recommend that farmers around the world focus on recycling their water or building a hydroponic farm in an elevated area away from low lying coasts. Students suggest incorporating wind, solar, and biomass as sources of cleaner energy. In addition, students feel that ridding farms of pesticides would not only make our food safer, but our water cleaner. Students often decide that the only way to protect animal habitats is to encourage their peers to write letters to Congress. 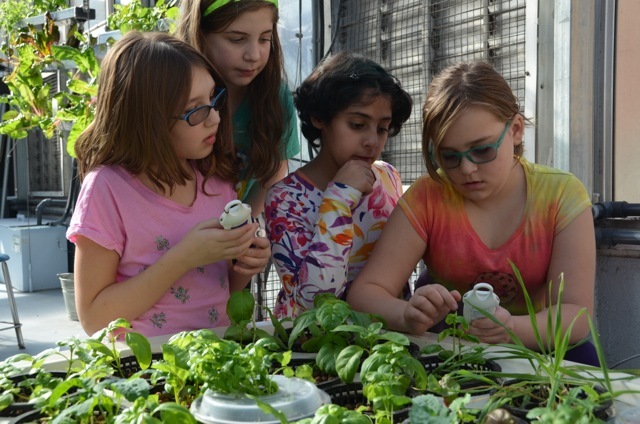 After six years of teaching in a rooftop hydroponic greenhouse I have watched first hand as eager kindergarteners blossom into conscientious adolescents, committed to combating climate change. These students have the right to learn the truth about our current climate crisis to solve it. These are our future inventors, researchers, activists, and technical farmers. I believe in my young scientists and know they will design a sustainable city, a wonderful world. Shakira Provasoli is a K-5 environmental science teacher at a public school in New York City. Ms. Provasoli began teaching 18 years ago as an early childhood teacher before following her passion for the natural world. She is the Sustainability Coordinator, heads a student green committee and a parent wellness committee, and coaches track and Lego League. In addition, Ms. Provasoli teaches a New York Sun Works course on Sustainability for New York City teachers, and she has written curriculum for New York Sun Works’ Greenhouse Project. Ms. Provasoli received a B.A. and an M.S.Ed. from Sarah Lawrence College, and STEM certification from Teachers College, through a NASA Endeavor Teaching Fellowship. In August 2016, Ms. Provasoli was honored at the White House, receiving the Presidential Innovation Award for Environmental Education. When Ms. Provasoli is not working, she can be found reading, running, and relaxing with her husband, two daughters, and dog.